According to conventional wisdom, a majority of voters are prepared to replace the President and are just waiting to determine if Romney will pass basic competence and viability thresholds. This reasoning is understandable and justifiable; Obama’s approval rating is beneath 50 percent, and he doesn’t hold 50 percent in the polls. While the Romney campaign espouses this view publicly, their ad strategy doesn’t align with that assessment of the race. Rather than build up their candidate’s image, the Romney campaign and their Super PAC allies have focused on attacking the President. That’s either a big mistake, or a sign that the Obama campaign is doing better than some think. By all accounts, attacks on the President are unlikely to move the polls. Obama has been president for four years and a public figure for longer, so voters probably have a pretty settled impression of his character and performance. The stability of Obama’s approval ratings are highly consistent with an electorate that has largely made up its mind about the President. A recent poll even shows that the public knows it’s made up its mind: According to Pew Research, 90 percent of registered voters say they already know what they needed to know about Obama. In contrast, Romney is largely undefined at this early stage, so emerging impressions are more malleable. Most voters know little about Romney, and a large number of Americans frequently indicate that they “don’t have an opinion” or are “undecided” about whether they have a favorable or unfavorable impression of the former Massachusetts Governor. The Pew Research poll, which showed that 90 percent of voters believe that they knew what they needed to know about Obama, reported that just 69 percent felt similarly about Romney. And research by the Vanderbilt/YouGov Ad Rating Project suggests that these numbers aren’t just abstractions. According to their analysis, attacks on Romney can cause plenty of independents to swing back into the undecided column, while attacks against Obama don’t move his numbers at all. What considerations undergird team Romney’s attacks on Obama? It’s worth recalling a New York Times piece from a few months ago on the soft tact taken by Crossroads. Based on focus groups conducted in Colorado, Florida, Ohio, and Missouri, Crossroads concluded that harsh attacks against the President backfired. Undecided voters had deep reservations about his performance, but they were unmoved by especially ideological attacks because they liked him personally. 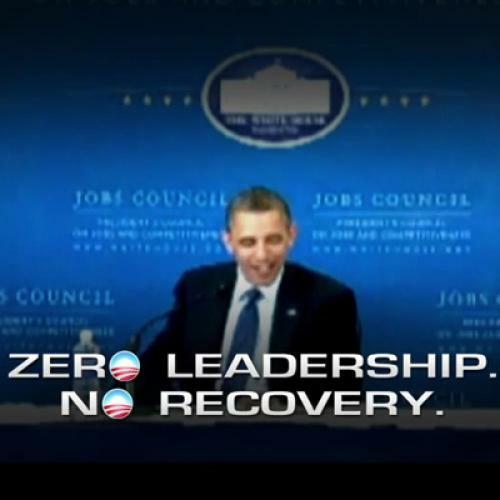 As a result, Crossroads decided to run advertisements focused on Obama’s disappointing tenure as President. While that might seem simple enough, there’s a very important but implicit acknowledgement underlying that choice: These voters were not clamoring to fire Obama. Instead, Crossroads talked to very conflicted voters, and decided it was necessary to air advertisements that reinforced their disappointment. There were clearly plenty of undecided voters who were frustrated by Obama’s tenure, but they might not have been prepared to vote for someone else, at least at that point. With that in mind, consider the counter-intuitive but rational explanation for Romney’s ad strategy: 50 percent of voters are not yet ready to vote against President Obama. While that might initially seem surprising, it’s not at all implausible and it might even be true. No, Obama’s approval rating isn’t above 50 percent. But you know what? His disapproval rating, something which gets less attention, isn’t above 50 percent, either. And a majority of voters usually say they have a favorable opinion of Obama. While it’s tempting to look at approval ratings at the expense of net-approval or favorability ratings, there’s a solid empirical relationship between all of them and election outcomes, and it might not be wise to unduly privilege any of these data points at the expense of others. Are there alternative explanations? We’ve heard a few. One is that the Romney campaign thinks they have the race in the bag, so why do anything other than keep Obama pinned down with negative advertisements. Of course, in that scenario, the chance that Obama could disqualify their candidate would be the only way Romney would lose, so it’s unclear why Boston wouldn’t guard against that contingency. Another holds that the Romney campaign just doesn’t have a response to Bain. But that’s not a reason to avoid positive advertisements about Romney more generally, and there’s obviously a positive case to be made on Romney’s behalf, even if you don’t like it. It's also possible that Romney plans to build-up Romney's image, just later in the race. But given team Romney's financial advantage, it's unclear why they wouldn't start sooner—especially considering the risk of being defined early. Then again, Romney recently aired their first positive advertisements during the Olympics, so maybe they really did just miscalculate, only to realize now that low favorability numbers are putting the race in jeopardy. Reading too far into campaign strategy isn’t always a good idea. But in this instance, the overwhelmingly negative character of team Romney’s early efforts requires an explanation. While the conventional wisdom holds that a majority of voters are simply looking for a viable alternative to the president, a broad set of evidence suggests it’s more complicated. On the other hand, if voters are really geared up to vote Obama out of office, then Romney should fire his staff for political malpractice. Failure to vigorously contest Obama’s negative advertising is endangering his chances.